Use these tubes to create garlands of any lenght, any size, and any shape. 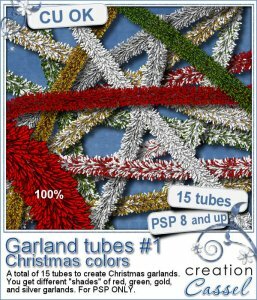 This set includes 15 tubes in Christmas colors: 4 golden garlands, 4 red garlands, 4 green garlands, 2 silvery garlands and one white. You can create various Christmas decorations, frames, alphas, tag ties, or even fill a surface for a fun texture. If you want to follow a very precise path, you can use the Vector Tube script from Gary Barton available here (for free). You can also get some Halloween color garlands.